New paper in Science shows that RNAs help certain molecules come together in liquid-like protected compartments, information that could have implications for understanding neurodegenerative diseases. Instead of an empty space, the inside of a cell is more like a packed sidewalk in Manhattan during rush hour. Molecules are jostling past each other on their way to destinations where they work in the cell. Researchers at the University of North Carolina at Chapel Hill have discovered that some of these destinations are protected compartments where proteins and messenger RNAs condense into liquid-like droplets, much like water condenses on grass to form dew. What makes certain molecules come together into the same droplet or “safe harbor,” and why is that important? 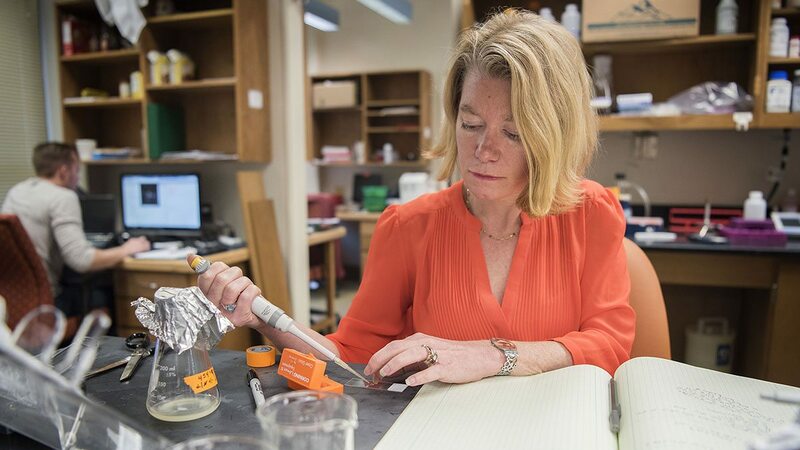 That’s what UNC-Chapel Hill biologist Amy Gladfelter and chemist Kevin Weeks unpack in a paper published online in the journal Science on April 12. “RNA, which folds in really interesting ways, is important to the selection process of who gets together in these droplets — and who is excluded,” she added. Gladfelter and Weeks’ labs partnered together on the research. Weeks is an expert on how single-stranded, ribbon-like RNA molecules are able to fold into intricate patterns and structures. This work has implications for understanding neurodegenerative diseases, according to Gladfelter. These liquid droplets occur under normal, healthy conditions, but through mutations, aging or stress, they become “irreversible” or “stuck.” At that point, they can’t dissolve anymore, she said. The latest findings are helping researchers understand how the right components can get recruited to droplets so that cells can potentially avoid that transition to an aberrant, solid state. Gladfelter stresses that understanding how a cell functions, and what happens when things go right, is fundamental to discovering what happens when things go wrong. “We can’t understand what goes wrong until we develop a greater understanding of how things work and what the rules are in a ‘normal’ cell,” said Gladfelter, who is an MBL Fellow at the Marine Biological Lab in Woods Hole, Massachusetts, where some of the foundational work for the research took place.